The Yates Family Vineyard is located on the slopes of the Mayacamas Mountains, which is located in the hills between the Napa and Sonoma Valleys. This mountainous district, 9 miles west of the town of Napa, was known as the “Napa Redwoods” in the late 1800’s. It is now recognized as the “Mount Veeder Appellation”. The vineyard is located at the end of beautiful Redwood Road. The Yates family has owned the property for more than 60 years. 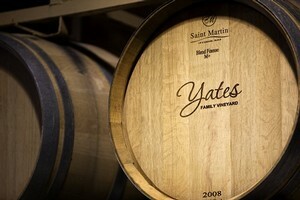 The 35 acres of steep, hillside vineyards were replanted by the Yates’ family in the early 1980s to Cabernet Sauvignon, Merlot, and Cabernet Franc. At an average elevation of over 1,100 feet, the site, with its combination of micro climates and volcanic soils, produces incredible grapes with intense fruit flavors. The vineyard is also home to the historic ghost winery that was built in the 1800’s. Known then as “Castle Rock Vineyard”, Ernest Streich, with son Robert, farmed and made wine until Prohibition in one of the original gravity flow wineries. Ahead of their time, they were one of the first to experiment with cultured yeast and temperature to control their fermentations. These elements all contribute to the extremely long-lived wines from this vineyard. Ultimately the telling is in the tasting. We hope you will avail yourself of the opportunity to discover our very special wines.